We are having an interesting adventure with local eating. First of all, our Florida Prince peach tree is bearing ripe fruit. Our first picking of ripe peaches this year. Oh, good, peaches! I’ll make a cobbler. I used a recipe from All Recipes online, and didn’t change a thing. It was fabulous. I went from “Oh good,” to “Oh God” in three days. 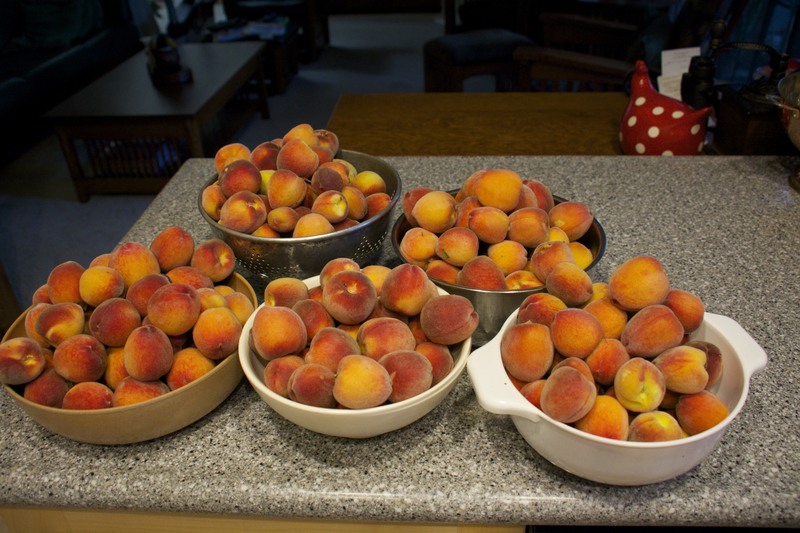 This was the second picking, over 18 lbs of peaches. I ran out of bowls to put them in. 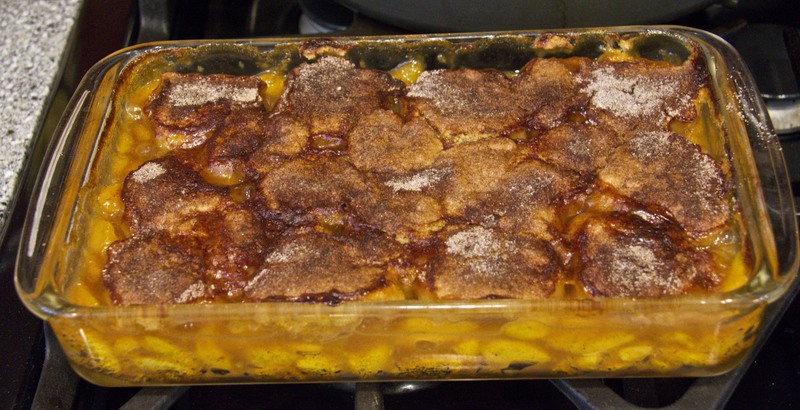 I made a second cobbler and put rest of the peaches into a cooler with ice until I can process them. I plan to make peach preserves today, and freeze the rest. But this is only part of the crop! There are still more peaches on the tree. They are tiny and take forever to peel, pit, and slice. I see my future stretching endlessly ahead of me…. 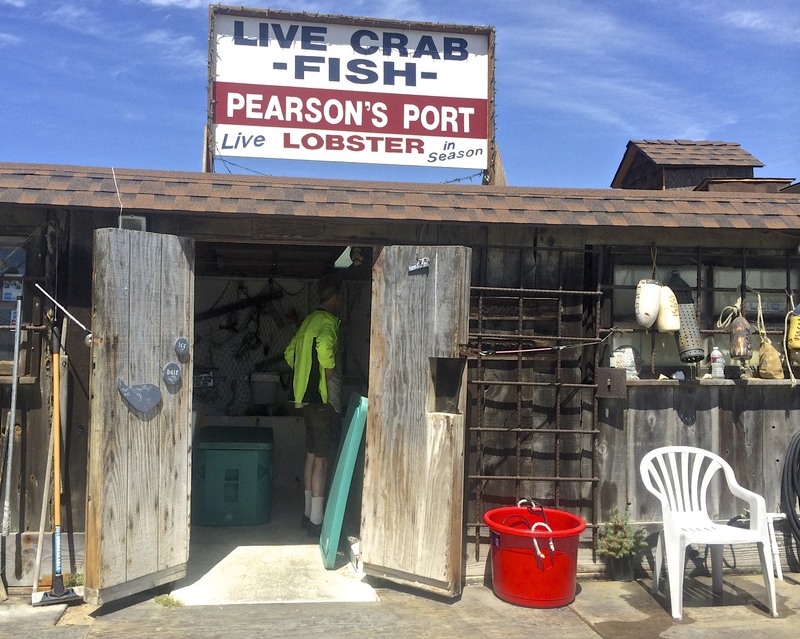 Some research showed that Pearson’s Port on Newport Bay is a fish shop that carries live Spot Prawns. Apparently, the prawns are best cooked as soon as possible (i.e., cooked while live), because the heads produce an enzyme that will spoil the meat within a couple of hours after the prawns die. This is not something that you want to buy dead on ice. I figured it would be best to buy the prawns around noon at Pearson’s Port rather than 6 am at the dory fleet, and have them for lunch. 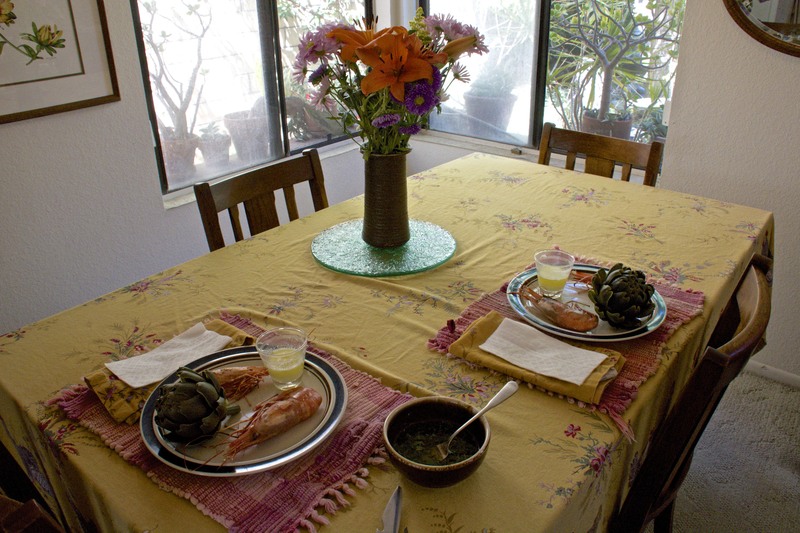 So we resolved to have Spot Prawns as part of our meatless Friday, as well as a local food. 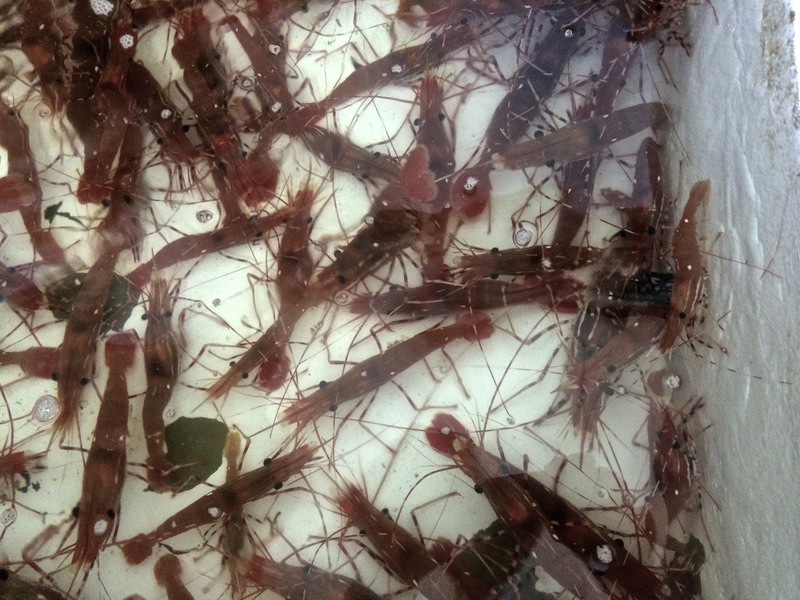 Live Spot Prawns in a tank. 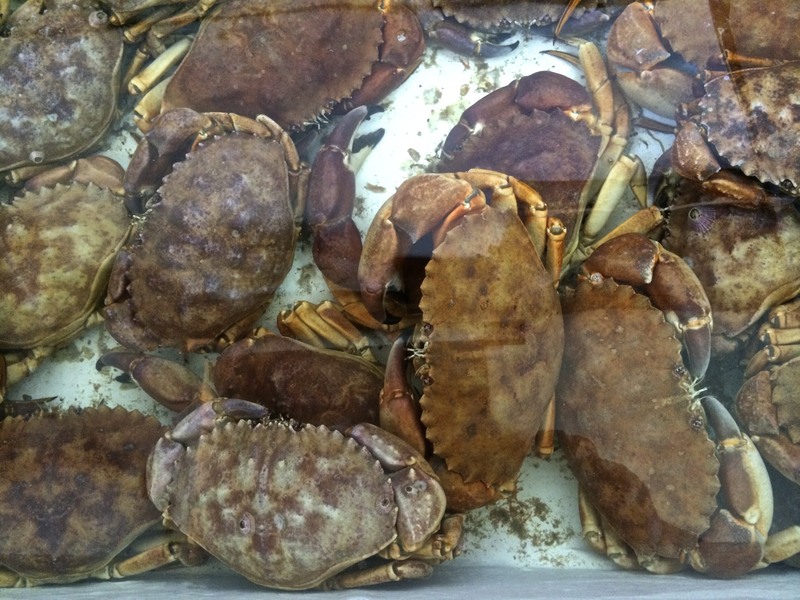 Live Yellow Rock Crabs in a tank. I plan to try some of these in the next week or so. We learned that Spot Prawns are sustainably fished, which is important to us. They are all born male, but by two years, they all turn into females. So the large prawns that we bought were all female, having been males last year. Weird. The man at the fish shop offered to take their heads off for us, but he recommended cooking the heads as well. And that is what I did. Spot Prawns cooking in a skillet with olive oil and rock salt. The prawns were pretty big. I sautéed the prawns for two minutes per side in olive oil and coarsely grated Himalayan pink salt. The idea is that you get the oil and salt on your fingers as you peel and eat the shrimp. I melted butter with lemon juice for one dip, and made a second dip of sesame oil, lime juice, cilantro, and a hint of mirin (sweet Japanese rice wine). Both were great. The tails were sweet and succulent, more like lobster than shrimp. The taste was divine, and I am definitely going to make them again. But not too often because the four prawns cost $15. Two were OK for lunch, but I could have easily eaten three. Or four. Or…. They were SOOOO good. The table set for two. 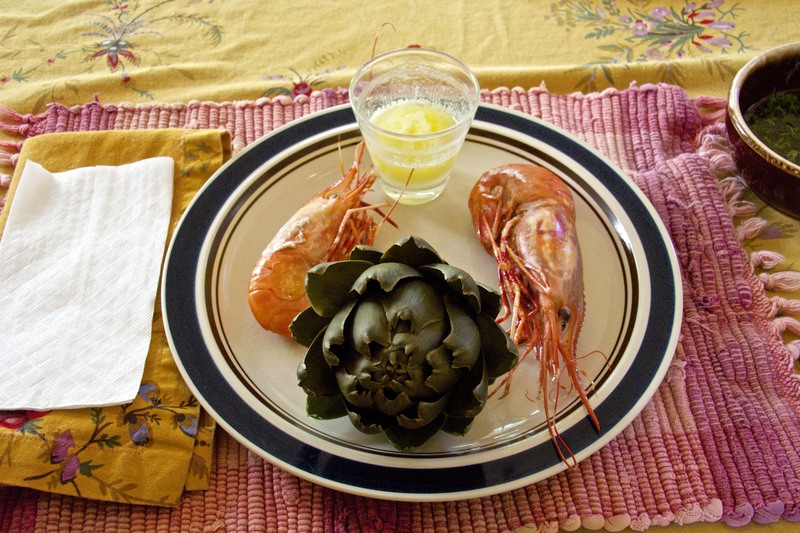 Spot Prawns and home-grown artichokes for lunch. That is about as local as one can get. The heads with thoraxes had a few drops of tasty liquid in them, but not much else except eggs. As an experiment, I decided to simmer the heads and the discarded shells from the tail in a quart of water to make a stock for Spot Prawn Bisque. I added a half onion, a carrot, a couple of stalks of celery, and half a cup of white wine. I also dumped in the rest of the lemon – butter that we had dipped our artichokes into. I thickened the stock with 1/4 C flour, and added a pint of half and half, and a goodly dollop of sherry. That was our spot prawn bisque that we had for dinner. But it was too much for one meal. The next night, I diced two gold potatoes, a half onion, and 3 ounces of bacon and fried that up until done. I added the leftover bisque to that and made a hearty chowder for the next night’s dinner. And there was enough of THAT left for lunch today. So we got four meals out of those four prawns. Not too shabby. 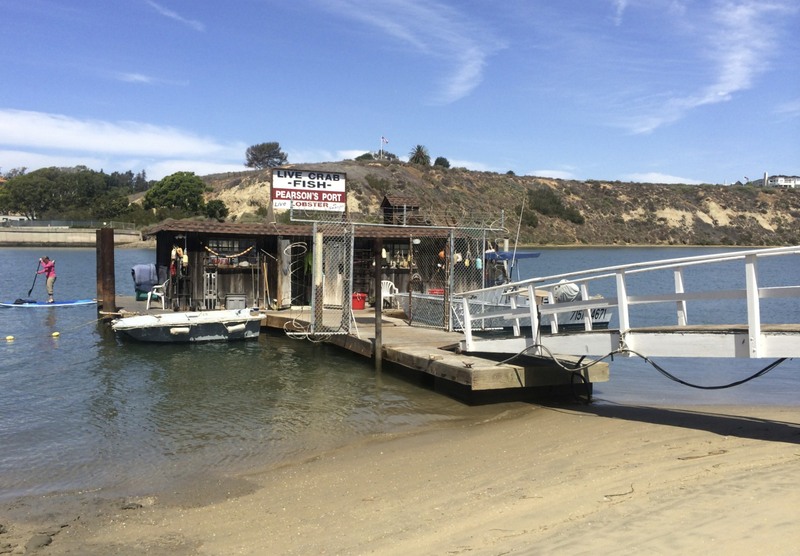 This entry was posted in Uncategorized and tagged artichokes, bisque, cobbler, dory fleet, local food, Newport Beach, peaches, Pearson's Port, spot prawns. Bookmark the permalink. 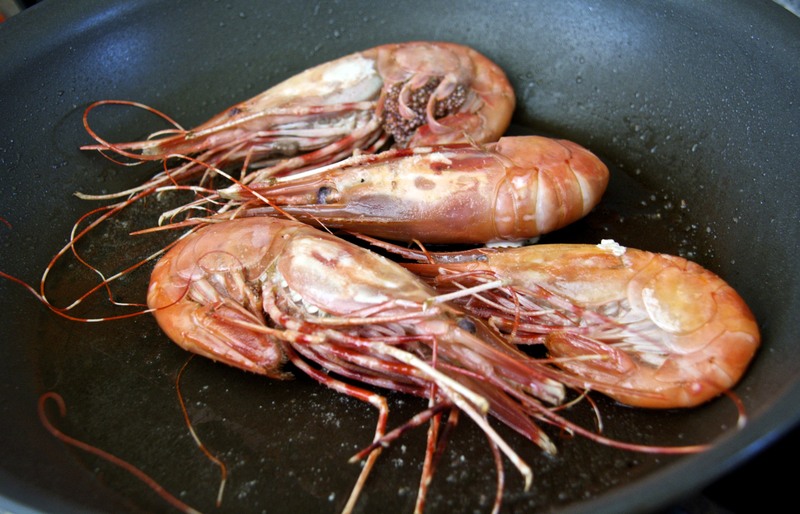 6 Responses to Peaches and Spot Prawns–but not together! Yum peaches. Mine are just starting to bloom right now. Daphne, wish I could leave comments on your blog too, but my attempts usually fail. Thanks for stopping by. Two big yums! I buy spot prawns at the wharf in Monterey, get them home ASAP and quickly saute them with garlic, fennel, mild pepper flakes, and a splash of wine. They are so sweet and tender. Michelle, the fennel and pepper flakes aren’t to my taste, but the splash of wine sure sounds good. I love the peaches! I know you said that they are starting to overwhelm, but when you get your preserves made you’ll be glad for the haul. 🙂 We have a place where we can buy from the fishermen in Mobile, Alabama and there is another one further down the coast in Grand Bay, Alabama. It is a really neat experience, but I haven’t been down there for a long time. Crafty Cristy, I’m glad to know that you too have access to locally caught seafood.